What is data gravity, and why should you care about it? Data gravity is data’s tendency to attract applications and services. Think of it this way: Wherever your data lives, you want your apps to be nearby. Otherwise, you can’t provide speedy analytics. 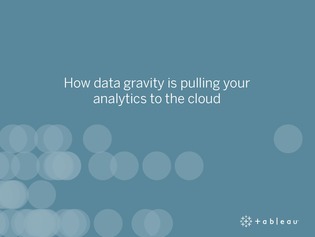 To ensure your analytics experience remains fast, you may want to consider data gravity as you plan out your analytics deployment. Read this resource to learn how to devise a modern strategy that can provide an analytics experience that’s as fast as your business requires.